Contact for last minute specials. We have four homes on Ocean Isle--Windjammer BB, Mermaid Crossing, Blue Crab and Starfish Cottage. Brand New Kitchen, Upscale, Granite, Stainless appliances, Everything Updated, .Large expanded deck. Windjammer II is one of eight units in this handsome, two-level townhouses located on the West End of Ocean Isle Beach. 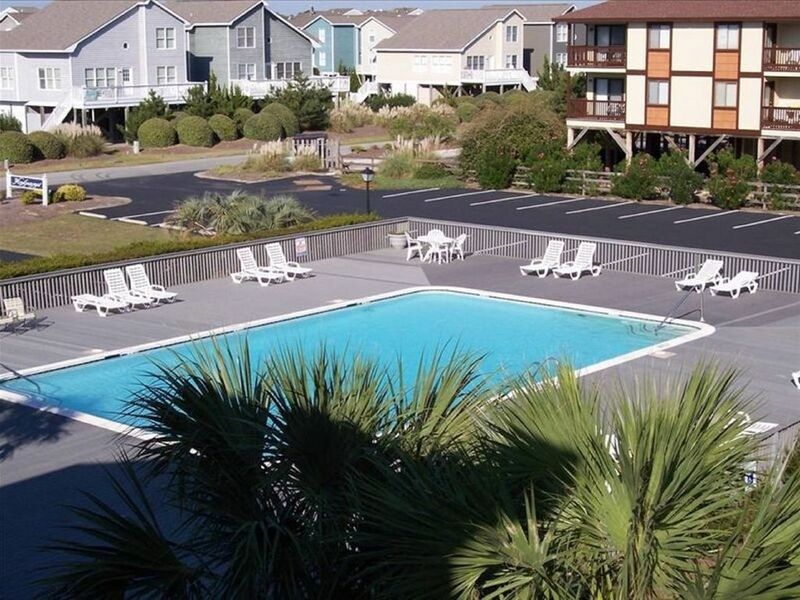 There is a large pool located directly in front of this recently-built, Non-Smoking townhouse. The pool is one of the largest on the Island. Our unit is not ocean view (there is one view) but you are just steps away (less than 30 seconds) to the beach with NO streets to cross! Simply go underneath our unit , Windjammer, to the beach access ramp/dunes. Very wide beach at the West end. Our townhouse is very large and spacious inside, and has two porches which overlook the sound side of the island. You are not and do not feel cramped in this home and it is much larger than most of the houses on Ocean Isle. This townhouse is the brightest of all. The kitchen is recently renovate with all new stainless appliances, granite, new kitchen cabinets, spacious with a large capacity refrigerator, new floors, and lots of cabinet space. The dining and family living area has new hard wood floors. ONE KING, ONE QUEEN,ONE QUEEN, TWO DOUBLES, TWO DOUBLES. The 2 master bedrooms are located on the main floor with their own private spacious bathroom. Upstairs there are 3 more bedrooms with three full bathrooms and a laundry area and lots of closet space. All bedrooms have CABLE TV, some have vcr's. The family area has a new flat screen TV and two bedrooms also have flat screens. We have books to read, games to play and movies to watch. The kitchen is brand new, renovated 2015, large with plenty of dishes, glasses, cookware, cocktail glasses and storage containers. The dining area is open and bright with a large glass dining room table and chairs and additional seating with a side table area. There is also a large new deck on the beautiful beach with a shower. You may sit on that porch and enjoy the ocean. We just expanded our main deck on the main level , which is off the family room, and there is a second porch is off a large bedroom. Enjoy the quiet island while relaxing on the porch, with a cool drink and your favorite book. You will also have access to our owners closet with a grill, beach chairs, pool floats, etc. The beach is beautiful, wide, and not crowded on the private West End of the Island. Parking is available underneath our unit for 3 cars along with outer spots located around the pool. Ocean Isle is 6 miles of beach with a few new restaurants, mini putt putt course, and ice cream parlor and arcade for kids. It is not a commercial beach, but a perfect place for vacationers and families to get together and enjoy a stress-free vacation. Call for additional rates or for off season vacation deals. We purchased this great townhouse because it was spacious, the proximity to the beach and it was on the private West end. It is only steps to the beach (just walk under the townhouses). The pool was nice size and we thought it would be a great house to vacation in. We live 7 hours away in Maryland, so we decided to rent since it is open many weeks out of the year. It is very reasonable compared to some of the other single family homes on the island. We also own 3 properties on the East end but they are priced a bit higher because they are single families home. This house is a GREAT DEAL, BEAUTIFUL AND CLEAN. We really enjoyed the room sizes, some of the bedrooms are bigger than our custom built homes. The kitchen is newly renovated all new cabinets, granite stainless appliances...the best windjammer kitchen. We love the two porches, watching families ride their bikes, drive golf carts or just taking leisurely strolls on the quiet small road. The pool is never crowded but big enough to enjoy and have lunches and dinners around. If the beach is too breezy then you can just come over to the pool and have the wind blocked by Windjammer. Our view is not of the ocean, it faces towards the sound, but it is the brightest unit which overlooks pool. The beach is so close, just walk under Windjammer and you are at the Beach access. We are also very close to The Isles Restaurant where you can enjoy the Tiki Bar or a nice dinner and then walk home. All bedrooms have their own unique bathroom with full tub. Windjammer Community is an Upscale Beach Community which is Ocean Front. Our view is of the sound. The building is considered Oceanfront, no streets to cross to get to beach access. There is no ocean view, it is partially blocked by Windjammer 1. Nice new refrigerator, larger than most. We moved a wall to fit a bigger size in. We do keep spices, some kitchen items, often coffee and tea. We hope our renters replace aluminum foil, plastic wrap, etc when used up. We try and stock the houses in the summer. We have plenty of dishes and utensils, for large families. We have plenty of storage containers and anything you would need. Brand new kitchen, bigger than other windjammer units . We have new cabinets, appliances, granite, and made it bigger. Dining table seats 8 comfortably. We have an additional white table with two chairs right next to it. We also have seating outside on porch. SIX Cable TV's, 3 New Flat Screen TV's , Renters may use owners closet with beach chairs, toys, boggie boards, etc. We had a fantastic stay at the Wind Jammer. The place was extraordinarily clean, spacious, and beautifully decorated. Having a bathroom is every bed room is one of the best parts of the home. Close to everything we wanted to do this weekend. Definitely will be staying again. Very nice place. Very clean. Close to beach. The Windjammer is a wonderful place to stay. It was clean and had a nice big pool. It is close to the beach and the nice walkway makes it easy to get out to the beach. Michele is very nice to work with and responded quickly. I would recommend this place to others. We loved Ocean Isle Beach. We liked the restaurants. Sugar Shack has excellent food. Don't miss that place. We would return to Ocean Isle Beach. We all had a wonderful vacation. The home was lovely and clean, and the location couldn’t have been better. We had a women’s retreat and the home was an awesome place to relax and fellowship. Lovely home, just as stated. Plenty of room for our crowd. Well stocked kitchen, everything you need. Will definitely stay again. This was our 2nd time renting this condo and it is perfect for a group. The 1st time we stayed here, we had 2 families. This time, I took a group of girls for my daughter's birthday weekend. Everyone had plenty of room and privacy. The fact that each bedroom has its own bathroom is a definite plus. And, the rooms are large enough that no one is cramped and everyone can spread out. The décor is colorful and cheery and the kitchen is large and fully stocked. The proximity to the pool is great, too. I could safely send the kids out to the pool without worrying. Also, you are just steps away from the beach as well. The owner is easy to work with and makes the whole procedure quick and uncomplicated. This condo is at the top of my list for future rentals! No pets are allowed at Windjammer. No golf carts or boats can be parked on premises. We have four homes on our website so email me. We will send you a contract when you want to book.